Detailed Description: The Stawamus Chief is a popular natural attraction that dominates the skyline in Squamish, BC, Canada. The Chief is over 702 metres (2303 Feet) tall and is the second largest free standing granite outcropping in the world - second to only the Rock of Gibraltar. 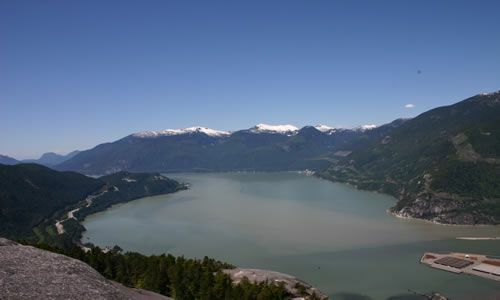 The Stawamus Chief rests in a 506 hectare provincial park. The granite monolith was created over 60 million years ago when the earth violently erupted spilling tons and tons of magma into the valley. 10,000 - 14,000 years ago, the ice age rolled in. For years and years massive plates of ice rolled through the valley shaping and eroding the rock leaving behind a highly polished mountain. Today, the Chief is a popular stomping ground for rockclimbers, hikers and photographers. 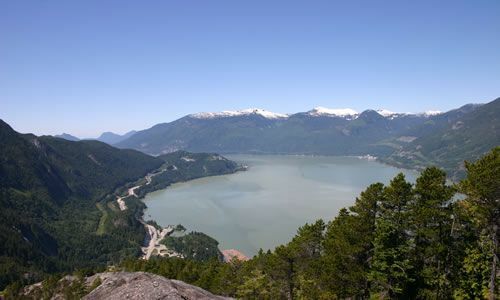 The hiking trails and rockclimbing routes leading to the peak of the Stawamus Chief provide views overlooking Howe Sound and the village of Squamish, BC, Canada and on a clear day such giants as Mount Garibaldi and Mamquam Mountain can be seen dominating the horizon. 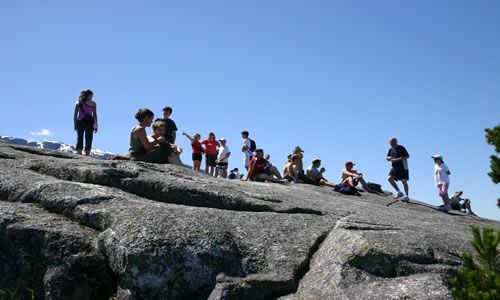 Some, the more experienced, reach the peaks by rock climbing, while most visitors reach the peaks by hiking up a steep path to any one of the 3 viewpoints. Much of the hiking paths involve navigating around big boulders and over tree roots while exploring through a west coast forest. The hiking trails leading to the 3 peaks start from the Stawamus Chief parking lot. The trail leading to the first peak is 1.5 km in length with an elevation gain of 500 metres. Takes 1-3 hours to complete depending on your fitness level. The second peak trail is a 1.7 Km trail with a 700 metre elevation gain. The third peak trail enjoys a 750 metre elevation gain. 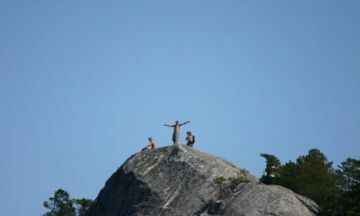 There is a 1.5 km hiking trail from the Shannon Falls parking lot connecting to the Chief's parking lot. The Chief is better known in the extreme adventure circles for its prime rock climbing routes catering to all levels of mountaineering abilities. It was not until 1961 did climbers conquer the many nubbins, cracks, fractures, ledges and overhangs on the rock face of the Stawamus. Thanks to these pioneers some of the more popular climbing routes exist today including the "Angels Crest", North Gully", "Cruel Shoes", "Exasperator" and "Triumph the Shadow" - to name a few. How to Get Here: Traveling north on Hwy 99 (Sea to Sky Highway) towards the village of Squamish, British Columbia, Canada take a right at the main intersection onto Logger's Lane. Continue down Logger's Lane for a short distance. Watch for the directional signs pointing to the parking lot of the Stawamus Chief Provincial Park.